Although you normally hear about trying to reduce or eliminate friction, it actually has some important uses. Quite often uses of friction can be seen from how things would be without friction. If there was no friction, you would not be able to walk, drive a car, or hold objects. Pens and pencils would not work. Friction is also necessary to stop a car or bike through the use of brakes. How is friction important in walking? How is friction used in writing? How is friction important in vehicles? You could not walk without the friction between your shoes and the ground. As you try to step forward, you push your foot backward. Friction holds your shoe to the ground, allowing you to walk. 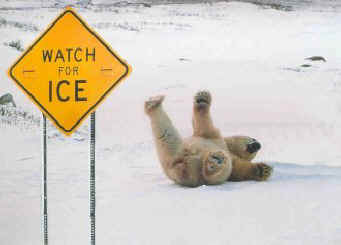 Consider how difficult it is to walk on slippery ice, where there is little friction. Writing with a pencil requires friction. You could not hold a pencil in your hand without friction. It would slip out when you tried to hold it to write. The graphite pencil led would not make a mark on the paper without friction. A pencil eraser uses friction to rub off mistakes written in pencil lead. Rubbing the eraser on the lead wears out the eraser due to friction, while the particles worn off gather up the pencil lead from the paper. Your car would not start moving if it wasn't for the friction of the tires against the street. With no friction, the tires would just spin. Likewise, you could not stop without the friction of the brakes and the tires. Friction is necessary in many applications to prevent slipping or sliding.